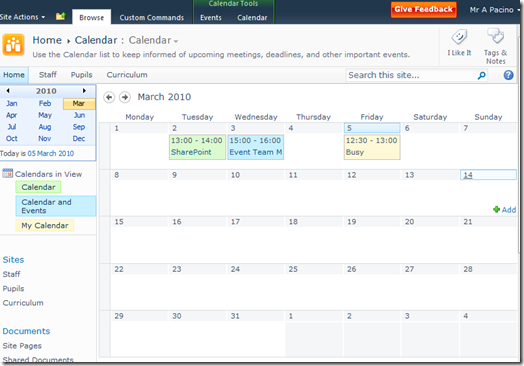 In Part 1 we looked at the new feature in SharePoint 2010 that allows you to place 2 SharePoint calendars on top of each other allow you to view them on the same calendar screen. Moving on from this we can now add our Exchange calendar as well. 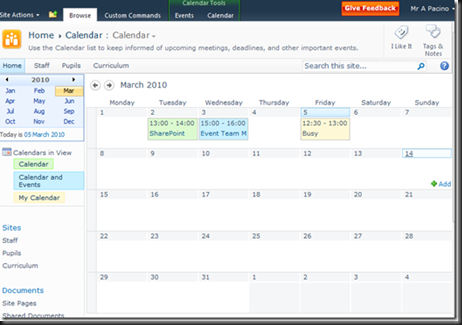 Continuing from the calendar we created in Part 1 click on Calendars in View down the left hand side. Give it a name and click on Exchange as a calendar Type. Fill in the Outlook Web Access URL and click Find. 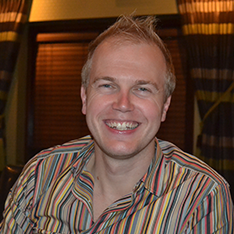 This will automatically fill in the Exchange Web Service URL as well. Hello, if i test it with groupcalender then i recieve a error that the trust ssl/tls connections cant build . i dont know what the system missed but it dont work. Thanks for the email. Do you have a certificate error when you go directly to your Exchange OWA. I’m working with our Exchange Admin trying to configure the Exchange 2010 sp1 owa to support SharePoint InBox and Calendar webparts… do you have a resource for configuring the Exchange server ? 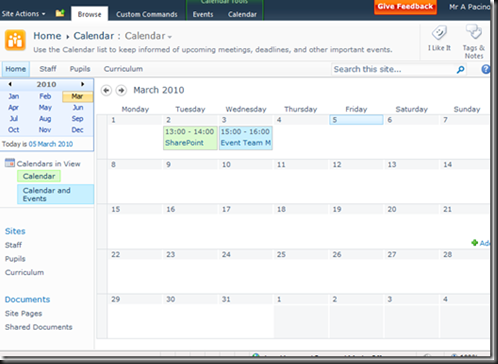 So I’ve got this configured as you list, but when I look at the calendar view in Sharepoint it shows the events as the time and “Busy”. It doesn’t list the event name or any details. Any ideas? 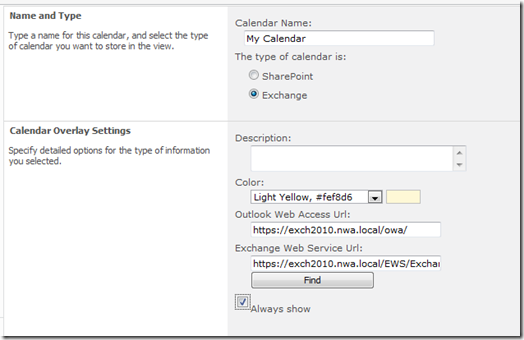 A very succinct post on the Exchange Calendar overlay process in SharePoint 2010. 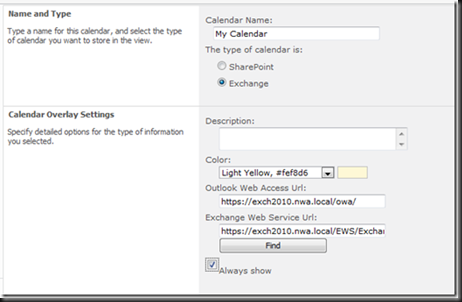 Many of my students ask how to overlay specific Exchange Calendars instead of the current user’s Exchange Calendar. Came up with a futzy workaround, but would love to hear any suggestions for improvement. Thanks for sharing this wonderful piece in a timely manner. 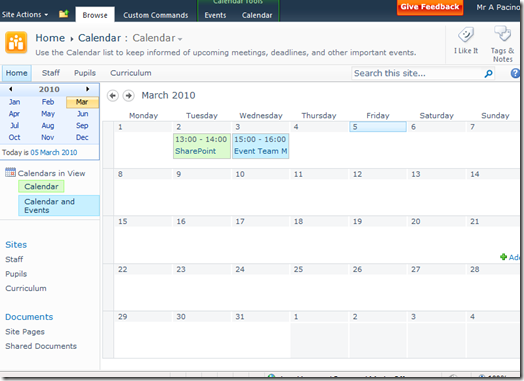 I was trying to accomplish the same thing with dataview but could never produce the calendar view. Your post explained it all. When I make the settings outlined I get the following error. When I navigate the the OWA https://mail.company.com/owa I do not get any error messages. Hi. Thanks for sharing this. I also get the error “Could not establish trust relationship for the SSL/TLS secure channel with authority”. Can you help me please? IS there anyway to show a different calendar on the overlay from exchange? I have mine showing, but I’d like to show others from my team on the same calendar.